Wedding in Fire Country. Darren Bifford. Nightwood Editions. Gibsons, British Columbia. 2012. In yet another example of just how buried in the sand my head can be Today's book of poetry is only now encountering Darren Bifford's 2012 publication Wedding in Fire Country. Some things are really worth waiting for. Milo and the research team insisted I read a couple of the reviews that appeared when Wedding in Fire Country was released but I'm not sure they read the same book I did. Those reviewers should have been raving, Bifford is brilliant. These poems have tender precision on the ends of a raptor's muscle ripping talons. These poems demand respect. Bifford can barely contain his many influences as Robert Kroetsch and Robert Lowell spill out of the back court, Czeslaw Milosz and Walt Whitman power it up and down the wings and then big old nasty William the Faulkner dances down the middle with his boozy wisdom. Oh ya, they're all in here along with Creely and the Beats. But Bifford never steals from his heroes, he gives them the respectful and polite nod and moves on from one breathless idea to the next. Did he really think he'd get away with it? That no one was watching? Some of these poems hit you like sunshine does when you walk out of the darkness of an afternoon movie. That CRACK of daylight/information hits like a smack. Today's book of poetry hit a proverbial wall about a week ago where all poems started to look a little like the same disappointment but Darren Bifford has snapped us out of that. Wedding in Fire Country is exactly the tonic we've needed. In a world where there has been a dearth of heart recently we discover that the talented Mr. Bifford has a heart as big as we need and it is right out there at the end of his articulate sleeve. It might be hunted by bears, wolves or cougars and haunted by fire, nightmare or impending disaster but this heart is in the game. Today's book of poetry gets future hopeful when we encounter books this fine. 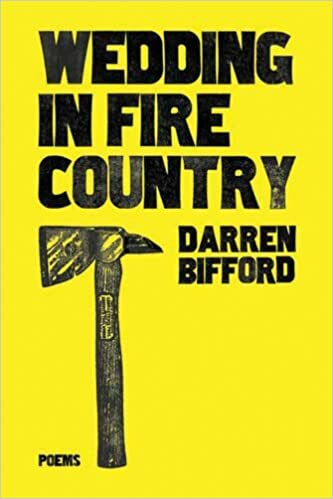 There is an army of excellent young poets hammering away in Canada and Bifford certainly stakes a claim with Wedding in Fire Country. Bifford had us on the edges of our seats during this morning's read. Our Jr. Editor, Kathryn, read the hell out of Bifford's long poem "Letters to Milosz" and confirmed what I'd thought from the start. Kathryn is a pistol and Darren Bifford's Wedding in Fire Country is delightfully dazzling poetry of a velocity you don't often see. I imagined being famous and humble. too tiny for my legs, its armrests too narrow to share. people are pushed around the other way. and the show is not the one we asked for. Quiet foreboding. Bifford has that nailed. Frankly, Today's book of poetry was a bit flustered (but not frustrated), by how familiar this new world was. Bifford is able to dial into a deep folkloric pool and emerge with new understanding of old wisdom. What is that knocking, mother? It's the wind's knuckles rapping the window, my son. What is that squeaking, mother? That's the procession of the mice within the walls, my son. What is that rotting in the basement, mother? Those are harvest apples in a bucket, my son. Who are the men crouching at the door, mother? They are my friends, my son. And they're coming. The best part of our mandate here at Today's book of poetry is finding gems and sharing them with you readers. Wedding in Fire Country is the sort of book that can make you fall in love with poetry again, instantly. These poems are smart like a challenge, clear and refreshing like a quenching tonic. Today's book of poetry couldn't get enough. Darren Bifford is the author of Wedding in Fire Country (Nightwood Editions, 2012) and Hermit Crab, forthcoming from Baseline Press. He lives in Montreal. Reading this collection, I feel communicated with, and indeed, carrying it around for several weeks to dip into during my spare moments, I came to feel companionate towards it, as though the poems’ frequent depictions of people enjoying each other’s company had bled into my consciousness, tingeing my worldview with its sociability. I suspect that Wedding in Fire Country will have a similar effect on anyone who spends some real time with it, and I heartily recommend doing so. “Nightmare” leaves you with a chill down your back with the last quote “they are my friends my son. And they are coming.” Bifford asks the question: is this the beginning of the nightmare or the end? These poems do not come together like one big story, but rather like stories told around a campfire; some happy, some scary, all intriguing.